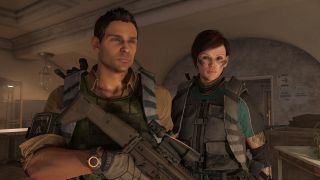 The Division 2 is all about chasing higher numbers to complete new challenges, but some players have discovered that the best way to min-max your character might now is hiding back in the early game. As pointed out on Reddit, the issue lies in the way The Division 2 distributes gear mods, those little items-within-items that can give you extra stat boosts on top of your normal equipment: currently, the best way for end-game players to grind for good gear mods seems to be with a new character. All the different ways that The Division 2 randomizes loot, and how all those variables can affect your characters' performance, can be dizzying - especially once you reach higher levels. Some mods increase how many charges a given skill has, others increase your armor, others boost the damage you deal with critical hits. The most sought-after mods do more straightforward stuff like increasing weapon damage. Much better to have your assault rifles do 5% more damage across the board than just get a 1.5% boost for occasional crits, right? Turns out it's a heck of a lot easier to get those weapon damage boosts (and other such useful mods) in your teens. They don't have the super high gear score, but with a percentage-based increase to damage, who needs it? This YouTube video demonstrates one such farming strategy: staying in the Dark Zone so you don't even have to worry about leveling out of the sweet spot. Once you get the mods you want, you can pop them in your Stash and retrieve them on your main character. Then laugh as you toss aside your high-gear-score-yet-incredibly-specific High End mods and slot in some good old fashioned blues and purples. Massive Entertainment will probably make some kind of change to rectify this super-counterintuitive gear boosting strategy, so if you want to enjoy the fruits of your low-level grinding you'd better get to work. In an odd coincidence, Anthem had a very similar problem that made endgame guns virtually worthless next to starting gear. But as our 60 second video review proves, we still think The Division 2 is the superior loot shooter.